The original single did not have it and it was great without it. When we played it the two times that we did it was sans piano. That piano part in my opinion has nothing to do with this song that Eric [Clapton] wrote entirely himself. It’s about his experience. Not Jim’s! Jim [Gordon, the band’s drummer] took that piano melody from his ex-girlfriend Rita Coolidge. I know because in the [Delaney & Bonnie] days I lived in John Garfield’s old house in the Hollywood Hills and there was a guest house with an upright piano in it. Rita and Jim were up there in the guest house and invited me to join in on writing this song with them called “Time”. I didn’t hear it as rock ‘n’ roll and bowed out of the little songwriting session. Her sister Priscilla wound up recording it with Booker T. Jones. I still don’t think that it’s rock ‘n’ roll and really has no place on Eric’s incredibly soul on the line for the world to hear song about his world and his experience. Jim took the melody from Rita’s song and didn’t give her credit for writing it. Her boyfriend ripped her off. I knew but nobody would listen to or believe me. I have told this story for years. That piano coda taints the integrity of this incredibly beautiful song. It has no place on it. Regardless of people’s feelings about the “Layla” coda, Ms. Coolidge ended up getting her own recording contract with A&M. She recorded for several years, including several solo albums and three with Mr. Kristofferson, without a lot of pop chart success. * That changed in 1977 with her top-ten platinum album Anytime…Anywhere, which included “(Your Love Has Lifted Me) Higher and Higher”, a #2 remake of a Jackie Wilson classic, and “We’re All Alone”, a #7 remake of a Boz Scaggs B-side. Apparently not wanting to waste any time after the success of Anytime…Anywhere, Ms. Coolidge released Love Me Again about two months after the last single from the previous album had dropped off the charts. While it didn’t reach the same level of success as its predecessor, Love Me Again did quite well. In keeping with her recent hits before Love Me Again, the first single released from the album was a remake. “You” was a remake of a single by Australian singer Marcia Hines, released the previous year. While Ms. Hines’s version was a #2 smash in her native Australia, it was never released in North America at all. Ms. Coolidge’s version of “You” has been described as more mellow than that of Ms. Hines, but it still maintains the disco sound of the original. The single performed much better on Billboard’s Adult Contemporary chart, spending 17 weeks there and peaking at #3 in early August 1978 (chart | magazine). Rita Coolidge continued to record for several years following Love Me Again, landing two more singles on the top 40 before stepping away from the music business for a while. These days, she is recording again, occasionally, and she is still performing as well. 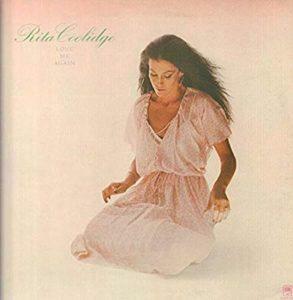 For some reason, pretty much none of Rita Coolidge’s singles get much airplay on terrestrial radio these days. I would enjoy hearing them on the radio again. How about “You”? * They did win a couple of Grammys recording together, though. ** Yes, I know Billboard used a period from mid-November to mid-November to determine its year-end chart back then.